FACT CHECK: More On Hillary Clinton And Fossil Fuel Industry Contributions A look at claims about the fossil fuel industry, lobbyists, superPACs and the Clinton campaign. 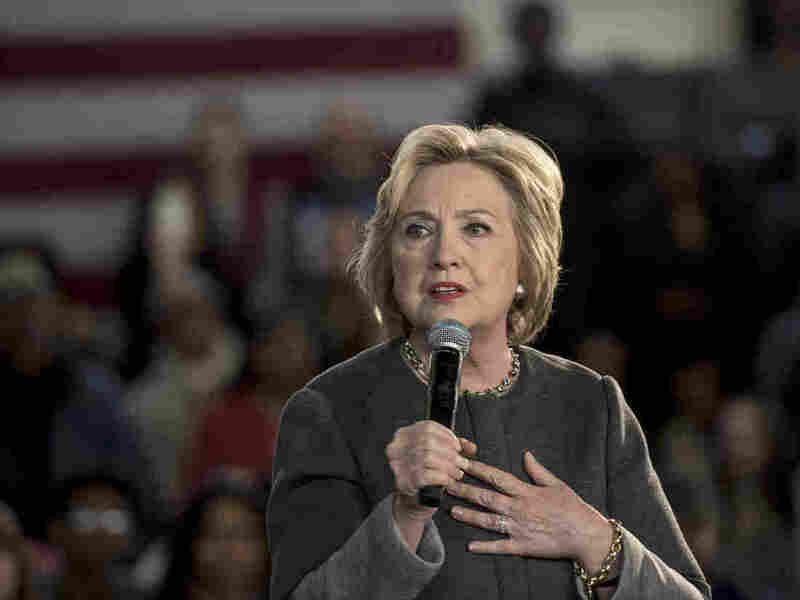 Democratic presidential candidate Hillary Clinton at an event in New York City on April 5, 2016. Greenpeace and Bernie Sanders' campaign continue to hammer at Hillary Clinton's ties to what the environmental group calls the "fossil fuel industry." NPR did a fact-check last week; this is a follow-up. The story so far: Greenpeace wants Clinton to sign a pledge that she'll stop taking campaign money from oil, gas and coal companies, their employees, investors and lobbyists. Last week a Greenpeace activist asked Clinton why she hasn't signed the pledge. Clinton said she doesn't take money from industry corporations or PACs. The exchange was caught on video. At the same time, Greenpeace issued an analysis that fossil-fuel money to her presidential bid exceeds $4.5 million. This fact-check looks in detail at one large slice of that money: contributions "bundled" by outside lobbyists who work on contract for fossil-fuel companies or associations. That's as opposed to lobbyists directly employed by energy corporations. What's bundling? It's fundraising by campaign supporters among their own networks. They "bundle" the money and relay it to the campaign. (The term dates back to the days of paper checks that could, in fact, be bundled.) All presidential campaigns rely on bundlers. It's an essential part of political fundraising, and the contributions are disclosed. Bundling doesn't include laundering. The Claim: The Clinton team "has received more than $4.5 million from lobbyists, bundlers, and large donors connected [to] the fossil fuel industry." The Question: Is that number accurate? The Short Answer: No, it's inflated. The Long Answer: We're talking about $1.2 million, bundled by nine contract lobbyists with ties to the fossil fuel industry. It's about one-quarter of Greenpeace's overall number. Just relying on disclosure records, it's a stretch to assert that it's all, or even mostly, fossil fuel money. The real issue is whether these nine lobbyists represent fossil fuel companies not just in their work, but in their bundling. A broader look at their client rosters suggest they don't. In quarter four of 2015, each of the nine lobbyists reported lobbying for between 3 and 37 clients. Most of the lobbyists had a single fossil-fuel client; two lobbyists reported two such clients. Greenpeace suggests that the presence of the fossil-fuel clients taints the lobbyists' bundled contributions from other donors. "This is where the influence peddling begins," Greenpeace democracy campaign director Molly Dorozenski said in a release this week. In sum, the lobbyists had 185 clients, of which 11 – that's 6 percent – were in fossil fuels. The eleven clients accounted for 10 percent of the money paid to the lobby firms that quarter by the nine lobbyists' clients. If the nine lobbyists had bundled contributions from fossil-fuel donors, we would know it through the Clinton campaign's financial disclosures. Without that bundled money, Greenpeace's total would be $3.3 million, not $4.5 million. The Claim: Priorities USA Action, a superPAC that received $3.25 million from fossil-fuel donors, supports Clinton in the primaries. The Short Answer: Pretty much true. The Long Answer: But there's a catch or two. Those donations represent less than six percent of the $55.5 million Priorities USA has raised this election cycle. The superPAC has spent $5.6 million supporting Clinton, according to the nonpartisan Campaign Finance Institute, but not a penny on ads attacking Sanders. What little it's spent on negative messaging so far has been aimed at Republicans. Still, pro-Hillary ads can't hurt. Priorities USA is playing in the primaries, even if it doesn't exactly act that way. The Claim: Clinton has gotten money from the coal industry too. The Question: What about the coal industry? The Short Answer: Big coal isn't interested in Democrats. The Long Answer: The industry is in big trouble. Peabody Energy, the top spender on lobbying last year, is fighting to avoid bankruptcy. Number-two spender Arch Coal filed for bankruptcy in January. And with big coal's natural tilt toward anti-regulation Republicans, industry donors have given just $1,540 to Clinton, $2,700 to Sanders.